Have you ever eaten a meal that is so humble it takes you by surprise? There are no big super foods here. No crazy punch of unusual or particularly bold seasoning. No exotic ingredient, rare or peculiar. What we have here are the basics – potatoes, tomatoes, cabbage. Staples. Hearty, strong ingredients that have fed people for centuries. Nothing in this dish screams of specialness or excitement, but in my mind, that’s precisely what makes it so good. My first bites of this meal were taken with a lack of enthusiasm. I expected nourishment, but nothing to get worked up about. As I continued to eat it, though, working my way through my plate, then seconds, and then leftovers the next two days, I fell in love with this humble meal. While I’ve called this dish simple, I don’t mean it as a slight. It’s a compliment. Hearty vegetables dressed up with aromatics and emboldened with a bit of peppery-heat make for a dish that feels like the best kind of old friend – familiar and warm, but still able to catch you by surprise. Bring a large pot of water to a boil. Submerge chopped cabbage in water and blanch for 5-6 minutes. Drain and set aside. Return pot of water to stove and return to a boil. Add chopped potatoes and boil 5-7 minutes, until tender. 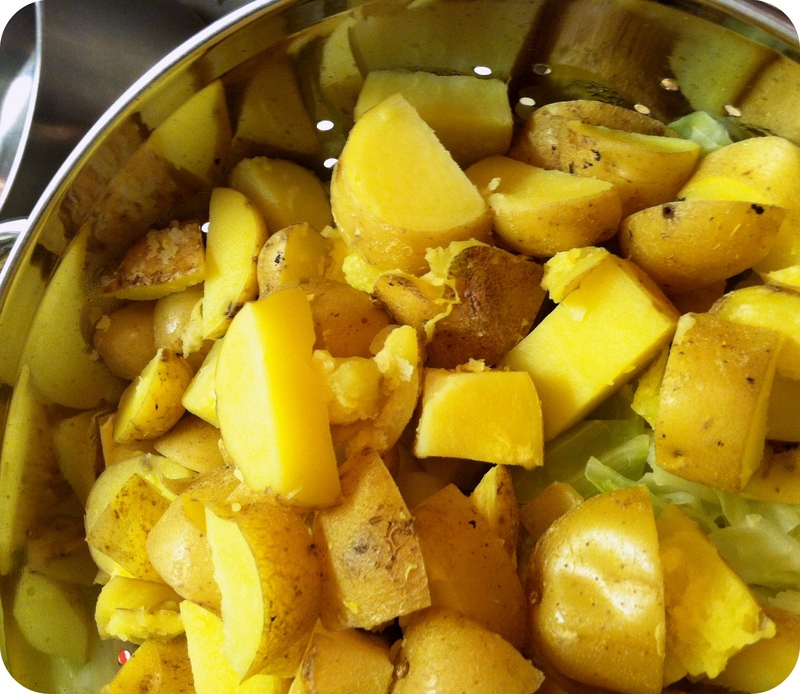 Drain potatoes, reserving ¾ cup of the cooking water, and set aside. Add tomato paste and agave into reserved cooking water, stir to combine, and set aside. Warm oil in a large pot or Dutch oven over medium heat. When warm, add onion, garlic, and bell pepper. Cook, stirring frequently, for 5-7 minutes until vegetables soften. Add tomatoes, chiles, tomato paste/water mixture, oregano, and cumin to the pot. Continue to cook for 5-6 more minutes. Add cabbage and potatoes to the pot. Add a hearty sprinkling of salt and pepper, too. Stir to combine all ingredients and let cook over medium heat for about 5 minutes, just to get everything combined and warmed back up. Turn off heat, add lime juice and cilantro, and stir to combine. Taste and add extra salt and pepper if needed. Serve over rice or quinoa, or with warm tortillas. Isn’t it great when something old seems new again? Maybe it’s an old shirt you find in the back of your closet that you’d forgotten about and re-discover with delight. Maybe it’s a hobby that had been set aside when life got busy but now feels like the perfect thing to do on a Saturday afternoon. Maybe it’s a bean. More precisely, maybe it’s kidney beans. 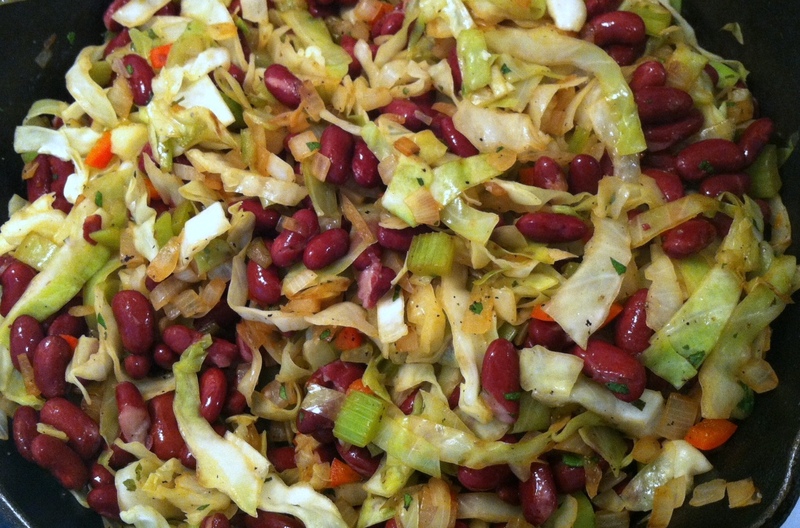 It’s no secret that I love beans and I generally find kidney beans to be my go-to favorite. They’re accessible, adaptable, and appetizing, for sure, but I’ll admit that I often combine them with the same sorts of flavors in the same sorts of ways. This means that while I always enjoy them, they tend to sort of taste the same each time. And then this dish happened and my expectation of how kidney beans could be prepared was completely turned upside down. 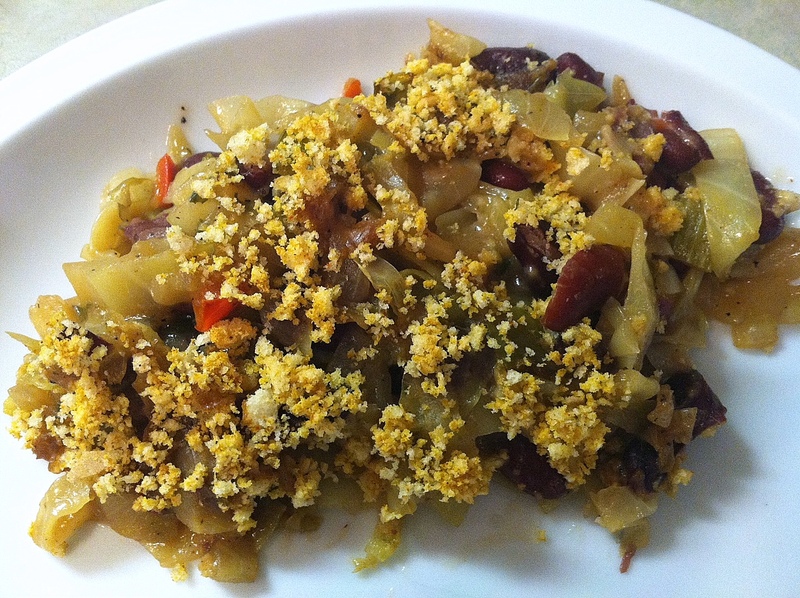 Instead of my traditional kidney bean thinking, which generally means pairing them with the flavors of Mexico, the Southwest, or sometimes, India, this dish paired the beans up with flavors more reminiscent of Europe, likely France. I fell in love with this dish and with kidney beans all over again. An old friend, feeling like a new discovery. Note: I loved this just as is described below and found the flavors of the marjoram, Dijon, and parsley to be flavorful, bright, and absolutely tantalizing. Mr. Move Eat Create, however, felt the dish really came to life for him when he drizzled a bit of white vinegar over his portion and mixed it in, adding a bit of bite to the overall flavor. Perhaps you could try a bit both ways and see for yourself. If making bread crumb from scratch, go ahead and chop those in your food processor. Combine fresh or store bought bread crumbs (or cornmeal) with nutritional yeast and cayenne pepper in a small bowl. Mix well and set aside. Warm a cast iron skillet or other large non-stick pan over medium-high heat. Add oil. 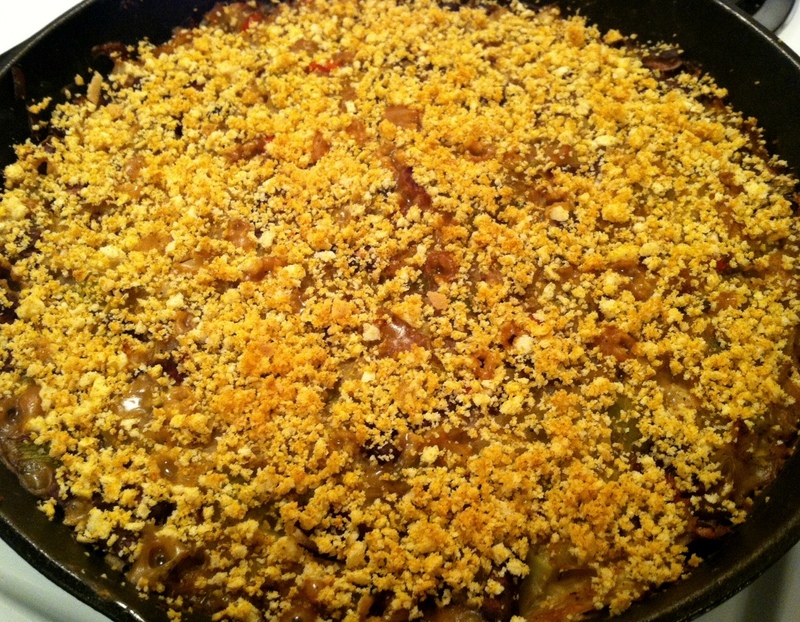 When warm, add onion and celery and sauté, stirring occasionally, for about 10 minutes, or until the onion starts to brown and lightly caramelize. Next add the cabbage, peppers and salt. 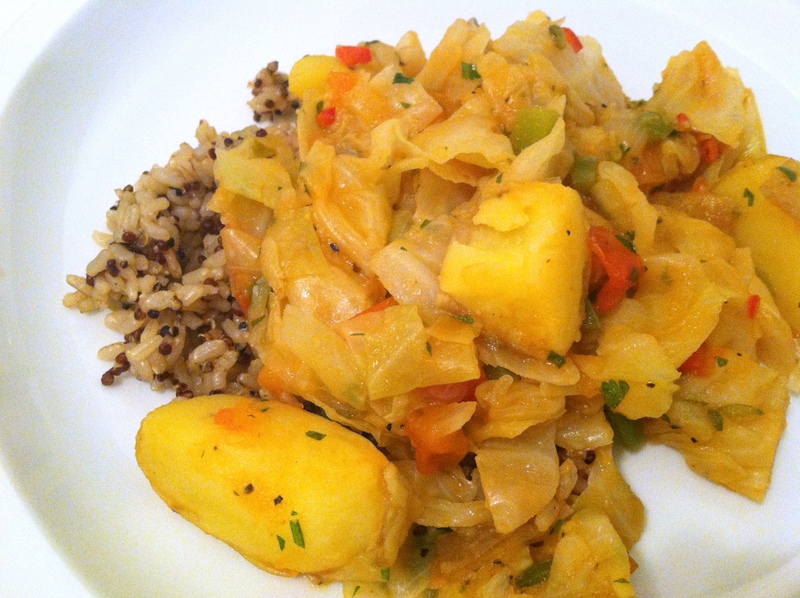 Cook, stirring often, for about 7 minutes, until the cabbage has cooked down and softened. Add beans, marjoram, parsley, and black pepper and stir well so that all elements are combined. Remove from heat and set aside. To make the sauce, melt the Earth Balance in a saucepan over medium heat. Add the flour to the melted butter and cook for 3-5 minutes, or until the mixture starts to brown and become smooth. Add the vegetable broth and mustard to the sauce and cook for 2-3 more minutes, stirring frequently until the sauce is smooth and well combined. You know those weeks that just wear you down? Those weeks where by Friday at 2pm, you’re kinda’ cranky, sorta’ grumbly, and hella’ worn out? Step 1: Crank up some music. I recommend music that is easy to dance around to in the kitchen and can be sung along with. My favorites for this scenario are: Amanda Palmer and Caro Emerald. I dump the albums into a playlist on my computer, turn on shuffle, and click play. Out from my speakers then comes big, strong female vocals with stellar music and lyrics. I also recommend vintage rat-pack era playlists on Songza (Sinatra and his buddies) for this purpose. Step 2: Pour yourself a glass of wine. I almost exclusively drink red and prefer Bordeaux and Cotes du Rhone (in case you feel like sending me a bottle!). Step 3. Gather ingredients for below meal and begin chopping. Step 4: Follow cooking instructions below, while taking plenty of time to swirl your glass of wine, sip at it frequently, shimmy around the kitchen, and burst into song with whatever verses most compel you to release your inner vocalist. Step 5: Lower music and gather around to eat finished meal with company of your choice. Let the comforting, warm flavors continue to help you unwind and welcome the weekend. 2. Add the diced onion and saute until very soft, about 10 minutes or so. Take your time with this and let the onion really cook slowly. 3. Add 2 tblspns paprika and stir well, so that the onions are coated. 4. Add shredded cabbage and a good couple pinches of salt. 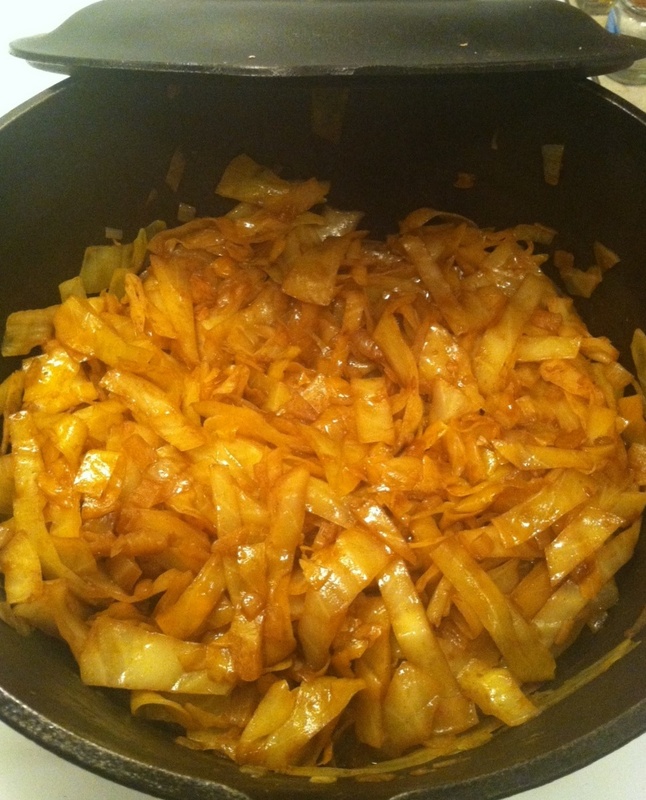 Stir well until the cabbage, onions, and paprika are well mixed. 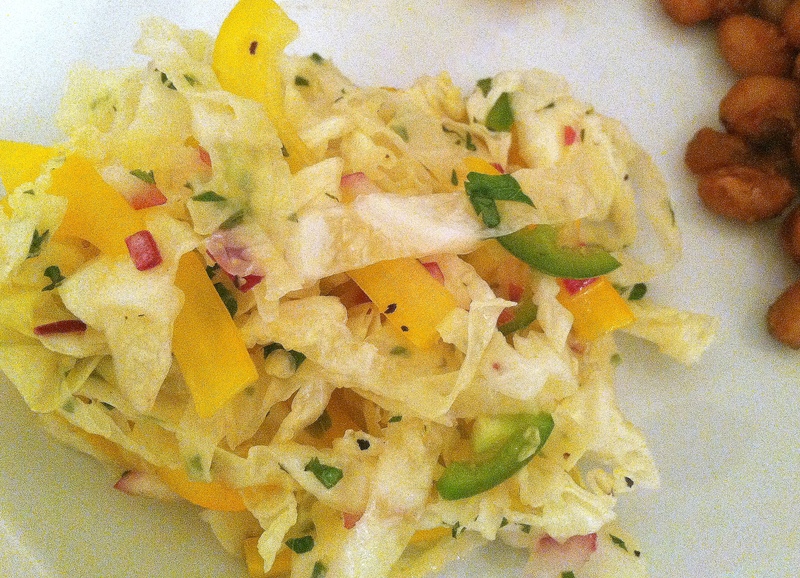 Take a look at this point, if your cabbage is not well coated with paprika, add up to one tablespoon more until it is. 5. Cover pot, reduce heat to low and cook slowly for 60-75 minutes, stirring occasionally, until cabbage is cooked very soft. 6. When the cabbage is nearly done, go ahead and cook your noodles according to package directions. Drain and set aside. 8. Serve with pepper of your choice for a bit of kick to contrast the sweetness of the paprika. Abraham Maslow was, in my humble opinion, a brilliant man. His well-known Hierarchy of Needs is studied in psychology and sociology classes throughout the world for good reason. The man knew a few things about human beings – and clearly he knew a few things about soup. This quote from Maslow speaks so wonderfully to his philosophy, I think, as well as to my own. Producing good food, even if (perhaps especially if) it is simple food – can be a wonderfully creative act. There are infinite possibilities with soup and they can result in a work of art – or an all out culinary disaster. And, as anyone who believes in Maslow’s theory about human needs knows, we must first be fed and nourished satisfactorily before we can transcend to greater levels of enlightenment and creativity. Well fed bodies are the foundation for well fed minds, so to speak. I also love this Maslow quote because it specifically calls out soup. Soup is one of my favorite foods to eat. Soup has the potential, when done well, to provide me with a particular kind of satisfaction that I always long for, whether I realize it at that moment or not. When all is not well with the world – give me a good bowl of soup and I will at the very least feel comforted. When all IS well with the world – well give me a good bowl of soup and it will only be better! The soup I present to you here is hearty and bright with the acidity from the sauerkraut. 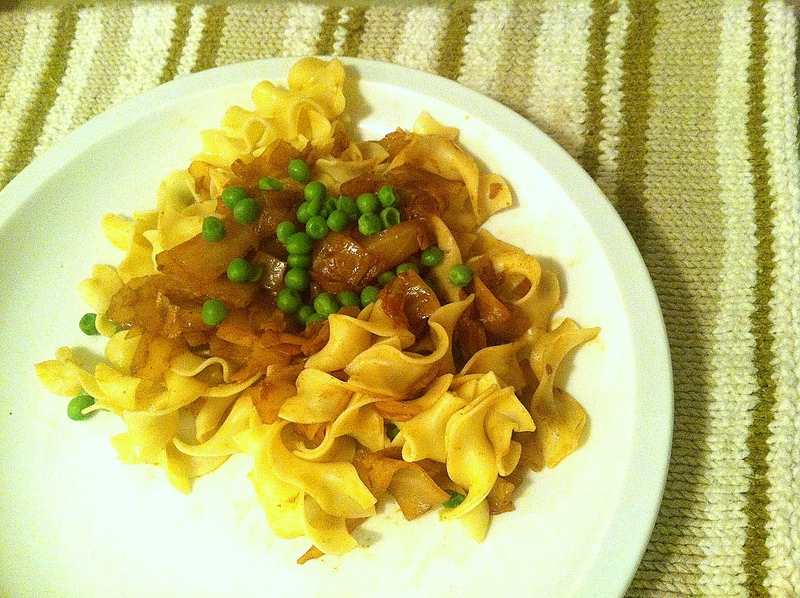 It’s a twist on a classic Eastern European dish – updated to nourish the healthy-minded. 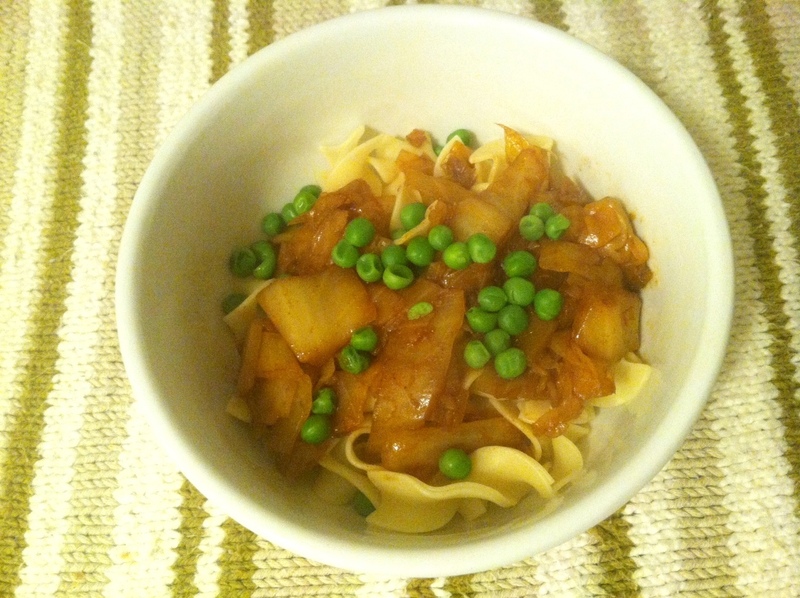 I also adapted the original recipe (found at the link below) to fit a vegetarian diet. 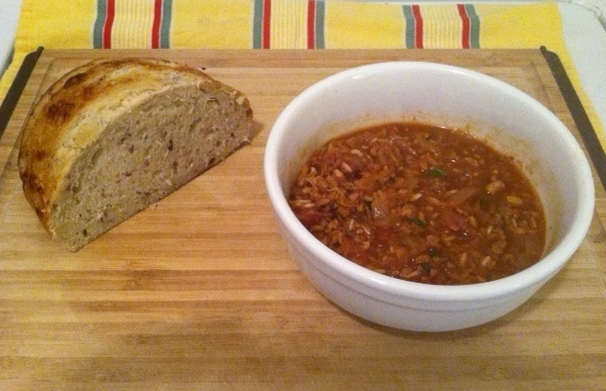 While I found the soup to be very satisfying on its own, I served it alongside some roasted cabbage slices (a simple, but absolutely delicious side dish) and a small loaf of onion-dill potato bread made locally. Mmmm. I wish I still had leftovers. Warm olive oil in a dutch oven or large pot over medium heat. Add onions and cook, stirring occasionally, until they begin to turn translucent (about 7-8 minutes). Add garlic to pot and cook, stirring frequently so garlic doesn’t burn, about 30 seconds. Add the rice and veggie protein crumbles. Cook, stirring frequently, for about 2-3 minutes. Add vegetable broth, tomatoes, sauerkraut, paprika, red pepper flakes, bay leaves, and salt. Stir to mix well. Bring to a boil. Then reduce heat and let simmer (uncovered) for approximately 40 minutes, or until your rice is tender and some of the broth has evaporated, making a thicker soup. Taste to adjust seasonings. Remove bay leaves and serve. 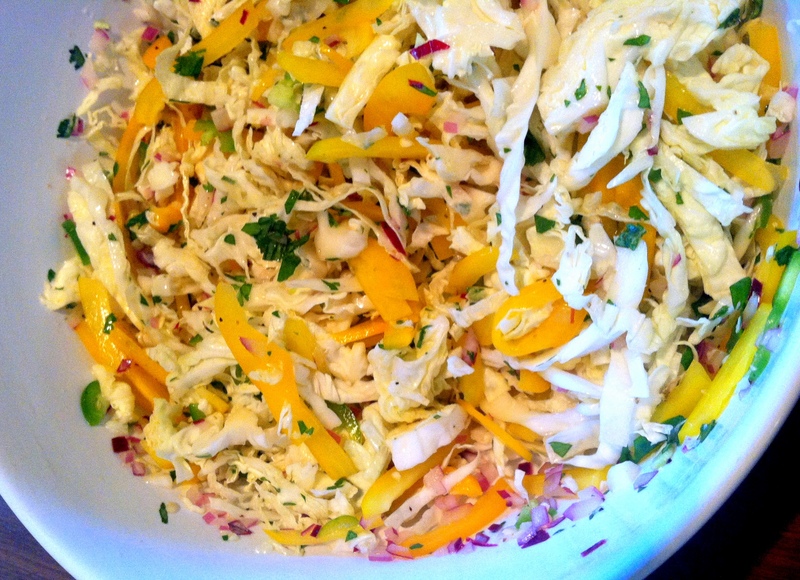 Cut cabbage into slices approximately ½ inch thick (You can do them thicker if you like. I prefer them on the thinner side because they crisp up a bit more – and I love crispy, charred vegetables!). Arrange slices on a baking sheet that has been sprayed with cooking spray. Whisk together the olive oil and lemon juice. 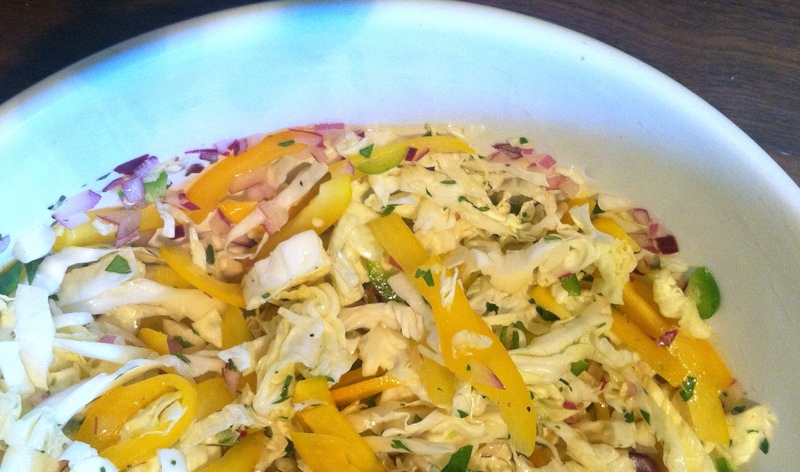 Brush or drizzle half of the mixture onto one side of the cabbage. Sprinkle liberally with salt and pepper. Turn and repeat on second side. Roast for about 25 minutes, flipping cabbage slices once halfway through.